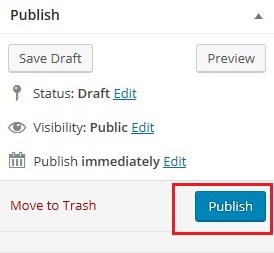 The WordPress editor makes it easy to create hyperlinks to web content on other websites. Maybe you want to share a blog recently posted on www.aauw.org or link to a photo album on the AAUW Facebook page. Here is a quick way to add external links to your posts and pages. Note: The process is the same if you want to link to your media library files. Suppose that you have uploaded a newsletter to your media library and want to add a hyperlink to it from one of your pages or posts. Copy the URL of your newsletter. To get the URL: (1) go to Dashboard/Media, (2) click on the newsletter, and (3) copy the whole URL that appears on the right-hand side of the screen. 1. 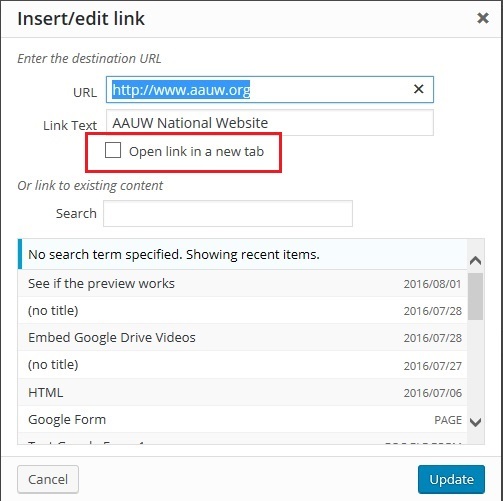 Suppose you want to add a link to the AAUW national website to your page. Copy the URL you want to link to (in this case, www.aauw.org). 2. Open the page or post that will contain the link, and highlight the text you want to turn into a hyperlink. 3. Click on the “Insert/edit link” icon. 4. Paste the URL you copied into the link box and click the “Apply” button. The highlighted text will now appear underlined and blue to let you know that it is linked. 6. 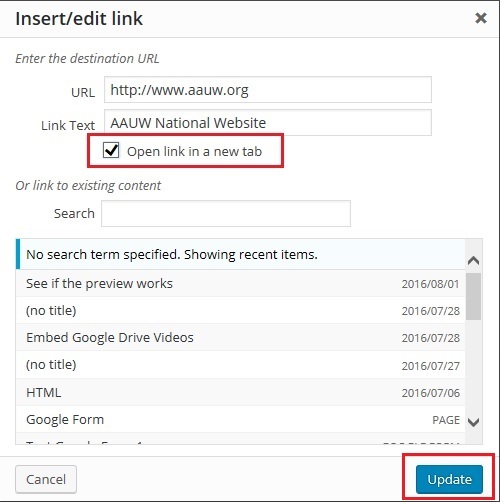 Select “Open link in a new tab” and then click “Update.” This sets the link target to open in a new page or tab when clicked. 8. Go back to your website. You have successfully added an external link to your page!